The porcupine is a large heavyset quilled rodent. It has short legs that move it slowly and it is usually solitary and nocturnal. Forms are found on all continents except Australia in two families containing six genera in the Old World and five in the New. The Crested Porcupine (Hystrix) inhabits the edges of the Mediterranean, parts of Africa and Southern and Western Asia. A similar species but not crested lives in South-east Asia and islands of Indonesia. Two brush-tailed versions (Atherura) share the habitats of the crestless porcupine above, and in West and west-central Africa. They both live in holes in the ground, eat insects as well as vegetable matter and vary from each other only in type of quill. Finally, in the Old World, there are the “Rat Porcupines”, (Trychis), forms of which dwell in Borneo, Sumatra and part of the Malay Peninsular. The Family Erithizontidae the Americas contains two major forms and a number of intermediate types. The North American forms are large ground-living and tree-climbing animals, the western form larger than the eastern but with a shorter tail. The tropical forests of Central and South America contain porcupines with prehensile tails. These tails are hairless and sturdy and are used to hang from. The northern family is furred between the spikes, the southern naked but for the spikes. The following refers to the North American porcupines. The porcupine's barbed quills detach easily and can become embedded in the flesh of an attacker. Not only do they inflict painful wounds, but they also work into the skin and may even cause death if they puncture vital organs or if the wounds become infected. Porcupine quills embedded in an attacker's face may prevent the assailant from feeding successfully, leading to death from starvation. The porcupine is the second largest of all rodents. It has a small head, a large, chunky body with a high arching back and short legs. Its head and body are 30 to 40 inches long, with a long, thick, muscular tail growing as long as 12 inches. It weighs from 40 to 80 pounds. 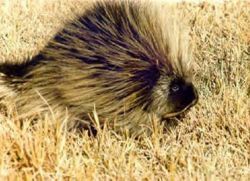 Long, yellowish guard hairs cover the front half of its body while up to 30,000 quills are interspersed among the dark, coarse guard hairs of the back and tail. These quills are the most distinguishing characteristic of the porcupine. The black-tipped, yellowish quills are stiff, barbed spines about 5 inches long that can become deadly once embedded in other animals' flesh. The porcupine is usually regarded as arboreal and found in woodlands. The porcupine is primarily nocturnal and may rest by day in hollow trees and logs, crevices in rocky bluffs or underground burrows. Porcupines are strict vegetarians. In the spring they feed on leaves, twigs and green plants. In winter, they chew through the outer bark of fir, hemlock, aspen and oak trees to eat the tender layer of tissue below. Sometimes, they will completely girdle, and thus kill, trees. They may also gnaw used ax handles, canoe paddles, crutches, or other items for the salt and oil they contain. The two large, front gnawing teeth continue to grow as long as the porcupine lives. Porcupines breed in the fall or early winter. The courtship ritual involves males who are looking for a mate uttering several high falsetto squeaks, while females announce their availability by squatting. When the two come together, they confirm the arrangement with a great deal of nose rubbing. One or two young are born with soft quills and eyes open about 10 days later. Their quills harden within the hour and they begin eating solid food after two weeks, but they continue to nurse for 4 or 5 months. While captives have lived up to 30 years, porcupines in the wild tend to have a life expectancy of 15 to 20 years. This page was last modified on 11 October 2012, at 16:56.